Get ready for hours of excitement with this collection of over 200 exhilarating games! There are wacky water games, riotous relays, totally cool travel games, and awesome large-group activities. 251 pages, from Harvest House. - Publisher As the director of Hume Lake Christian camps, one of America's largest youth camping programs, best-selling author Bob Phillips knows his stuff when it comes to fantastic group games. Packed with offbeat and unique indoor and outdoor games for all ages, group sizes, and occasions, this book will make any event an instant hit. 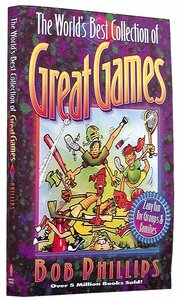 Novel ball games, unusual obstacle courses, exhilarating night games, crazy relays, and totally cool travel games make this collection fabulous for kids and must have resource for parents, youth pastors, and child care workers. - Publisher The director of one of America's largest youth camping programs offers offbeat ideas, indoor and outdoor games for all ages, and unique activities for groups of any size. This book will make any event an instant hit. About "World's Best Collection of Great Games"
As the director of Hume Lake Christian camps, one of America's largest youth camping programs, best-selling author Bob Phillips knows his stuff when it comes to fantastic group games. Packed with offbeat and unique indoor and outdoor games for all ages, group sizes, and occasions, this book will make any event an instant hit. Novel ball games, unusual obstacle courses, exhilarating night games, crazy relays, and totally cool travel games make this collection fabulous for kids and must have resource for parents, youth pastors, and child care workers. The director of one of America's largest youth camping programs offers offbeat ideas, indoor and outdoor games for all ages, and unique activities for groups of any size. This book will make any event an instant hit. Bob Phillips, master compiler of inspirational verses, Scripture references, and quotes on the lighter, humorous side of life, has written dozens of books with combined sales of more than seven million copies. They include Fabulous and Funny Clean Jokes For Kids! The World's Greatest Wacky One-Line Jokes and Laughter From The Pearly Gates. Bob also serves as director-at-large for Hume Lake Christian Camps and is a licensed family counsellor in California.